Every year thousands of eagles congregate in the Squamish Valley to feast on the salmon spawning in the rivers. In our land based eagle viewing tours you will be able to visit locations along these rivers where the eagles gather by the hundreds. The peak periods where the highest number of eagles are present is between mid-December and mid-January, however, there are still significant numbers in November and February. The eagles start arriving in mid-November and stay until mid-February. Along the eagle viewing dyke in Brackendale is the easiest way to view the eagles. We will take you there in the comfort of the luxury SUV. There are volunteers at the eagle viewing area with telescopes to watch the eagles and a nearby cafe to warm up or grab a hot coffee. If you want to get away from the beaten path our drivers know where the eagles like to hang out in the trees and would be glad to take you there. Some spots are right next to the road, others are a short walk through old growth forest. When walking down to the river you may even get a chance to see some salmon in the river. The Tenderfoot Creek Fish hatchery in Paradise Valley is a good place to view eagles and also see a working salmon hatchery at work. Brackendale is a residential community just north of Squamish. The Brackendale Art Gallery sponsors the annual eagle count each January, drawing international crowds. Although, almost 4,000 eagles were counted in 1994, the numbers have been declining and less than 1,000 were counted last year. They are most abundant along the banks of the Squamish and Cheakamus Rivers. The Bald Eagle (Haliaeetus leucocephalus Greek hali = salt, aeetus = eagle, leuco = white, cephalis = head) is a bird of prey found in North America. It is the national bird of the United States of America and appears on its seal. Its range includes most of Canada, Alaska, all of the contiguous United States and northern Mexico. It is found near large bodies of open water with an abundant food supply and old-growth trees for nesting. The adult Bald Eagle is mainly brown with a white head and tail. The sexes are identical in colour, but females are 25% larger than males. The beak is large and hooked. The plumage of the immature is brown. 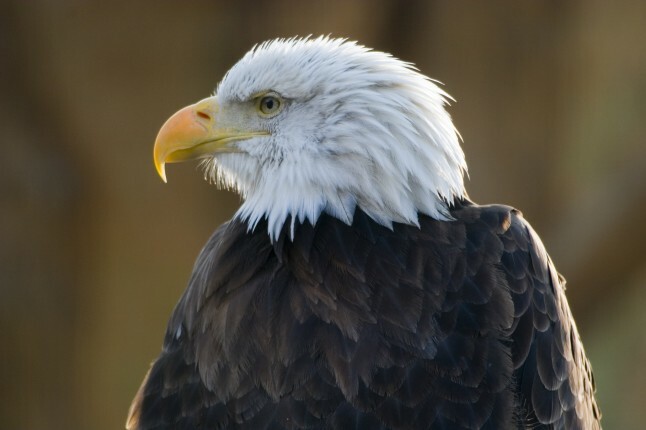 Bald Eagles are not actually bald, the name derives from the older meaning of the word, “white headed”. In the late 20th century the Bald Eagle was on the brink of extinction in the continental United States, while flourishing in much of Alaska and Canada. Populations recovered and stabilized, so the species was removed from the List of Endangered and Threatened Wildlife in the Lower 48 States on June 28, 2007. The Bald Eagle requires old-growth and mature stands of coniferous or hardwood trees for perching, roosting, and nesting. Selected trees must have good visibility, an open structure, and proximity to prey, but the height or species of tree is not as important as an abundance of comparatively large trees surrounding the body of water. Forests used for nesting should have a canopy cover of no more than 60 percent, and no less than 20 percent, and be in close proximity to water. Areas along the Sea-to-Sky highway on the way to Whistler from Vancouver Airport are ideal and during the right time of the year, the chances of seeing eagles on the way to Whistler are very high. The Bald Eagle is a powerful flier, and soars on thermal convection currents. It reaches speeds of 56–70 kilometers per hour (35–43 mph) when gliding and flapping, and about 48 kilometers per hour (30 mph) while carrying fish. Its dive speed is between 120–160 kilometers per hour (75–99 mph), though it seldom dives vertically. It is partially migratory, depending on location. If its territory has access to open water, it remains there year-round, but if the body of water freezes during the winter, making it impossible to obtain food, it migrates to the south or to the coast. The Bald Eagle selects migration routes which take advantage of thermal updrafts and food resources. During migration, it may ascend in a thermal and then glide down, or may ascend in updrafts created by the wind against a cliff or other terrain. Migration generally takes place during the daytime, when thermals are produced by the sun. Its diet consists mainly of fish, but it is an opportunistic feeder. It hunts fish by swooping down and snatching the fish out of the water with its talons. Spawning trout and salmon provide most of the Bald Eagle’s diet. Locally, eagles may rely largely on carrion, especially in winter, and they will scavenge carcasses up to the size of whales, though it seems that carcasses of ungulates and large fish are preferred. They also may sometimes feed on food scavenged or stolen from campsites and picnics, as well as garbage dumps. Mammalian prey includes rabbits, hares, raccoons, muskrats, beavers, and deer fawns. Preferred avian prey includes grebes, alcids, ducks, gulls, coots, egrets, and geese. Most live prey are quite a bit smaller than the eagle, but predation has been recorded for animals up to the size of mature swans, adult raccoons and young ungulates, all of which are larger than eagles. Reptiles, amphibians and crustaceans (especially crabs) are preyed on when available. Bald Eagles have powerful talons and have been recorded flying with a 15-pound Mule Deer fawn. This feat is the record for the heaviest load carrying ever verified for a flying bird. It has been estimated that the gripping power (pounds by square inch) of the bald eagle is ten times greater than that of a human. Sometimes, if the fish is too heavy to lift, the eagle will be dragged into the water. It may swim to safety, but some eagles drown or succumb to hypothermia. When competing for food, eagles will usually dominate other fish-eaters and scavengers, aggressively displacing mammals such as coyotes and foxes, and birds such as corvids, gulls, vultures, and other raptors. 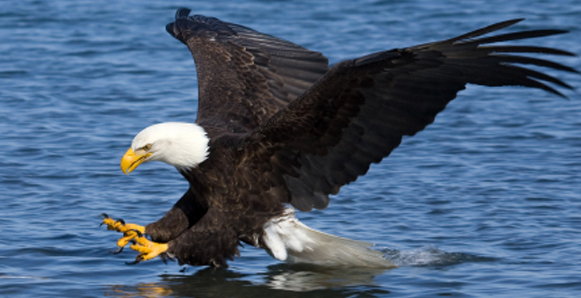 Occasionally, Bald Eagles will steal fish and other prey away from smaller birds. Healthy adult Bald Eagles are not preyed on in the wild and are thus considered apex predators. Bald Eagles are sexually mature at four or five years of age. When they are old enough to breed, they often return to the area where they were born. It is thought that Bald Eagles mate for life. However, if one member of a pair dies or disappears, the other will choose a new mate. A pair which has repeatedly failed in breeding attempts may split and look for new mates. Bald Eagle courtship involves elaborate calls and flight displays. The flight includes swoops, chases, and cartwheels, in which they fly high, lock talons, and free fall, separating just before hitting the ground. The nest is the largest of any bird in North America; it is used repeatedly over many years and with new material added each year may eventually be as large as 4 meters (13 ft) deep, 2.5 meters (8.2 ft) across and weigh 1 metric ton (1.1 tons). One nest in Florida was found to be 6.1 meters (20 ft) deep, 2.9 meters (9.5 ft) across, and to weigh 3 tons (2.7 t). This nest is on record as the largest tree nest ever known. The nest is built out of branches, usually in large trees near water. When breeding where there are no trees, the Bald Eagle will nest on the ground. Eagles produce between one and three eggs per year, but it is rare for all three chicks to successfully fly. Both the male and female take turns incubating the eggs. The other parent will hunt for food or look for nesting material. The eggs average about 73 millimeters (2.9 in) long and have a breadth of 55 millimeters (2.2 in). The Bald Eagle is extremely sensitive to human activity, and is found most commonly in areas free of human disturbance. It chooses sites more than 1.2 km (0.75 mi) from low-density human disturbance and more than 1.8 km (1.1 mi) from medium- to high-density human disturbance. Occasionally Bald Eagles will venture into large estuaries or secluded groves within major cities, such as Stanley Park next to downtown Vancouver. Factors in Bald Eagle population reductions were a widespread loss of suitable habitat, DDT, as well as both legal and illegal shooting. Many of the hunters killed the Bald Eagles under the long held mistaken beliefs that Bald Eagles grabbed young lambs and even children with their talons. Other causes of eagle deaths include power-line electrocution and collisions in flight. Bald Eagle populations have also been negatively affected by oil, lead, and mercury pollution, and by human and predator intrusion. The Bald Eagle is a sacred bird in some North American cultures, and its feathers, are central to many religious and spiritual customs among Native Americans. Eagles are considered spiritual messengers between gods and humans by some cultures. Current eagle feather law stipulates that only individuals of certifiable Native American ancestry enrolled in a federally recognized tribe are legally authorized to obtain Bald or Golden Eagle feathers for religious or spiritual use. Obey posted closures of climbing routes on the Stewamus Chief cliff face from March to July, during the critical nesting season of the peregrine falcon. Book your Eagle Viewing Tour with Alpine North Limousines Today!